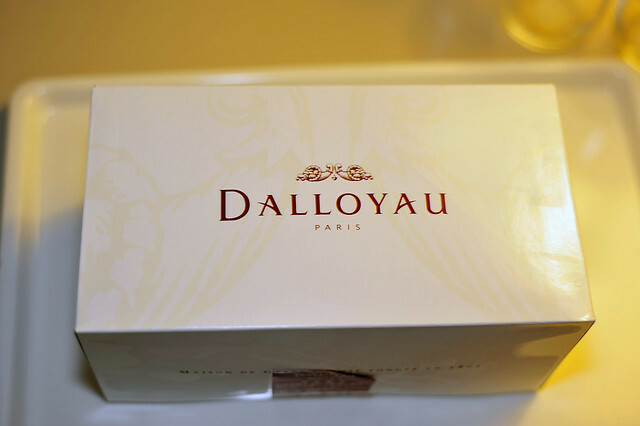 Dalloyau is an old guard in french cuisine and pastry making, dating back to the 1700s during the time of Louis XIV. Since then, it has evolved and and “internationalised”, opening its first overseas branch in Japan back in 1982. 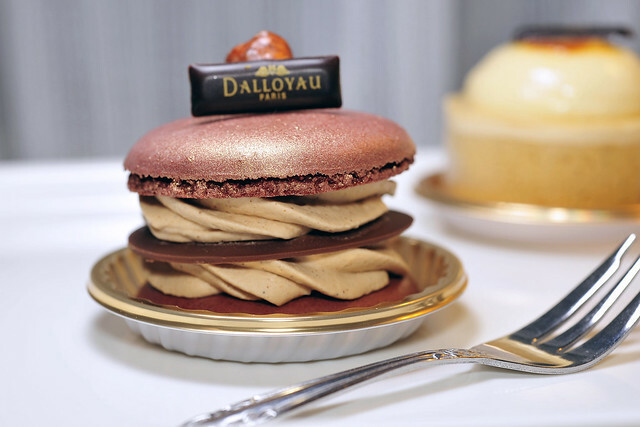 Surely its one of the very first to have done so, waaaaaay ahead of others like PH, Laduree and Maison du Chocolat. Having walked past their shops when we strolled along Shinsaibashi-suji, we have to sample their works. Alas the salon de thé was closed already and only takeaways were available. We couldn’t be happier. We brought back to the hotel, which was incidentally just a comfortable 5 min walk away, 3 individual sized pieces. 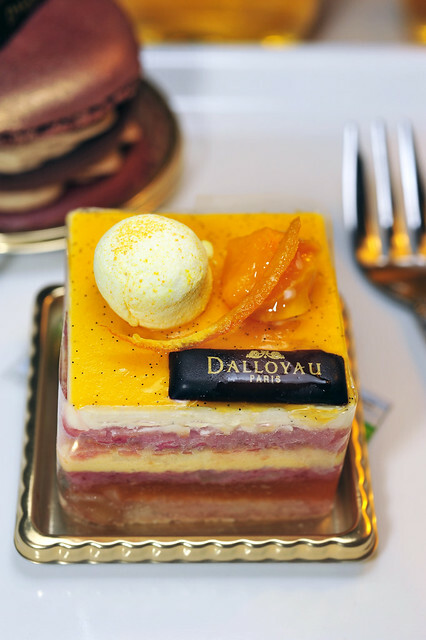 Tendresse de Fruits Mangue Passion et Yuzu, a sliced entremet with the longest name I’d ever heard on a pastry. 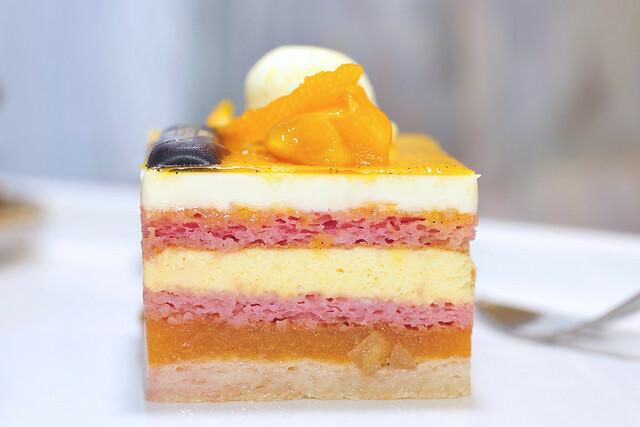 This is a complex piece with several components, using a biscuit russe aux amandes as a base and working its way up with layers of joconde sandwiching with layers of compotée de mandarines et abricots and creamy textures which reminds of chiboust. 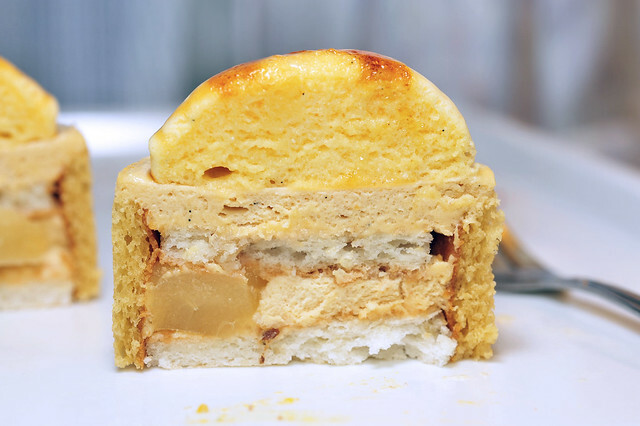 The top is finished with a yuzu vanilla glaze before embellishing with a cube of fresh mango and a piece of guimauve (marshmallow) and fresh orange peel. 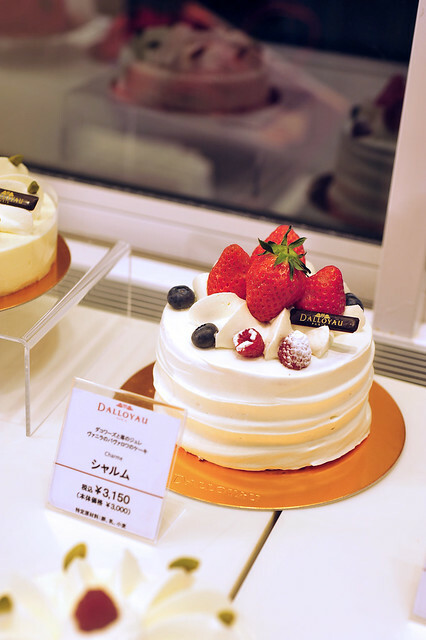 Very artistically crafted, it does not only look fantastic, but tastes really delicious! Flavours generally carry a tangy edge from the use an a wide assortment of fruits from yuzu, orange, mango, passionfruit and even apricot. Seldom have I seen so many fruity flavours on a single piece, lest fresh fruits on a tart of course. 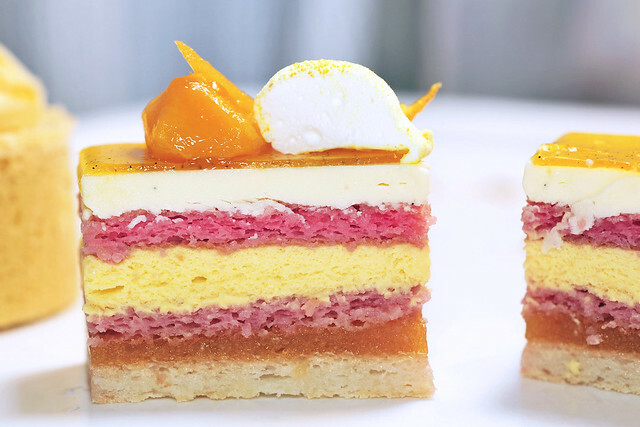 But to incorporate very tart-tasting fruits into one single piece, amalgamating it altogether whilst allow the space for each individually component to stand out must have been quite a nerve-wrecking task! The only shortcoming in this piece is the lack in contrast in taste. The tartness could perhaps be better exuded with a darker note to complement it. 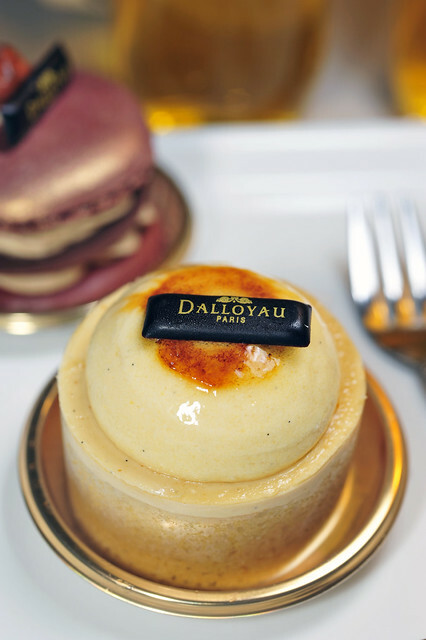 But then again, to remain tart may be the true intentions of the patissiers at Dalloyau when they first created it in 2010. The raspberry pink joconde layers add much to the aesthetics of the piece in terms of color contrast but did little to polish the taste. Then again, having too many a flavour all packed in one piece may be too conflicting and interfering. Overall a really enjoyable piece! 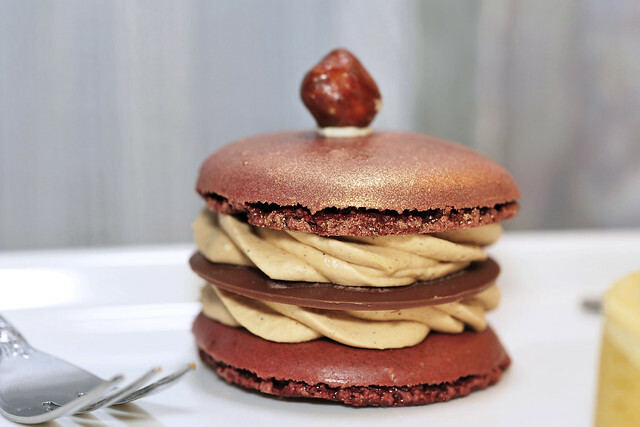 Insolent Noisette, which is essentially a large macaron sandwiched with a tempered chocolate medallion, chocolat noir ganache and of course, hazelnut praline cream and hence the name! 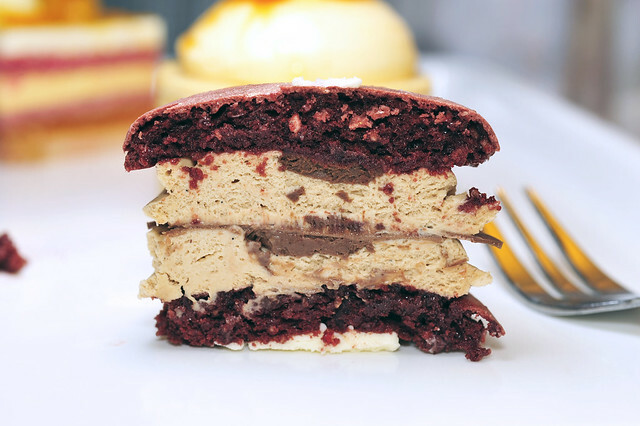 Firstly, the macaron shells were not very well baked, with the dome almost separately from the base, indicating that the oven temperature was probably a tad too high during the baking process causing the dome to rise too much and subsequently become separately from the base, which forms the deep “slit” upon cooling. The texture of the macaron shells are “ok” with nothing much worth shouting, but the creme au beurre aux noisette is quite delicious, with the aroma from caramelised hazelnuts really coming through, bitterness amidst the sweetness, thus providing the taste a bit more balance. The dollops of dark chocolate ganache just below the chocolate medallion and the top shell gives the piece more depth. Its also a good piece to sample after the earlier “Tendresse” piece, with a lot of contraste between the two. Not too bad on the whole, if only the macaron shells are done better! Trésor, as the name implies, is a treasure chest. Or at least that was what Dalloyau hoped it to be when they conceptualised it. The petit gateau was aesthetically rather pleasing, with not much of the fanciful visual appeal which the earlier two pieces had. 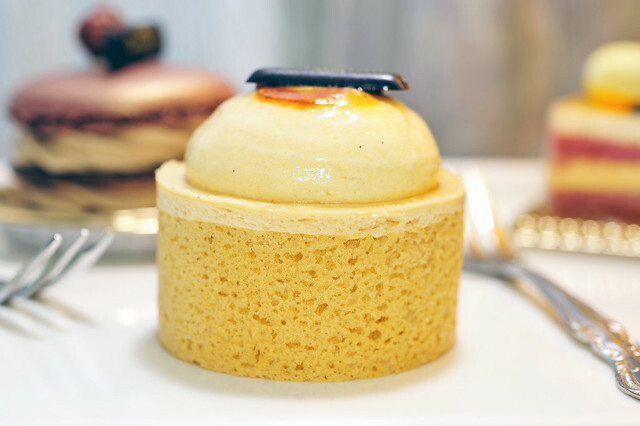 It comprises of two main parts, a base made from a thin layer of sponge into a round mousse ring, and a creamy dome which was piped over subsequently. A slice through revealed rather messy if not shoddy construction, especially with the base. Just under the creamy dome is a liqueur-infused mousse, which was delightful. So that we like. The morsels of cooked poire Williams was quite intriguing. The flavours are good, infused with liqueur as well (possibly Kirsch) but why is it at one side? And there are jarring gaps, creating from the discs of dacquoise being cut a tad too small that it should be. Very odd if you ask me. The creme brulee dome was delicious, espcially with the top being slightly caramelised. But we can’t help but think that the overall piece could be better presented on several accounts. 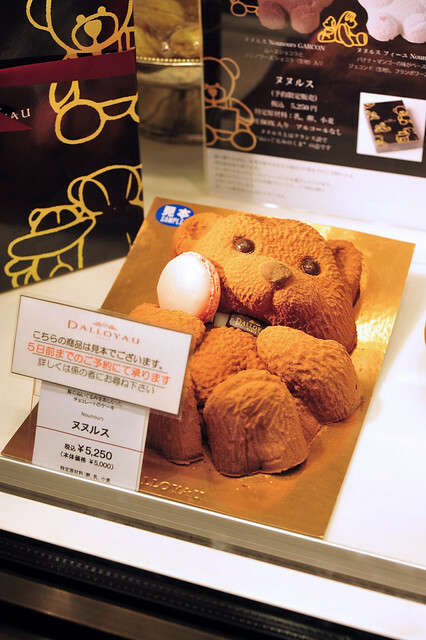 A teddy bear molded cake which has to be pre-ordered. 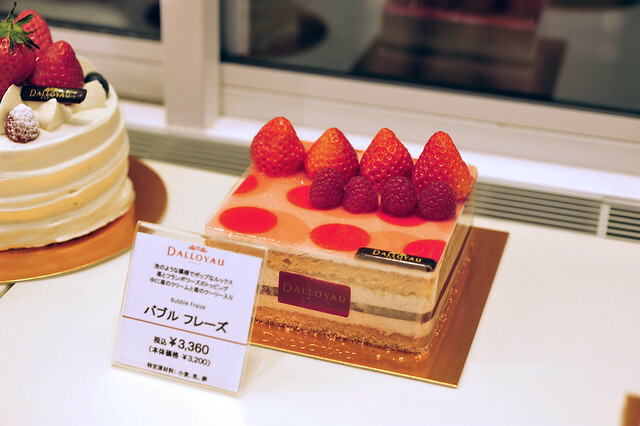 A lovely entremet named Bubble Fraise. Though I feeling the “entourage” of 4 strawberries and 4 raspberries made it look kinda off. Definitely not helping with the decor! 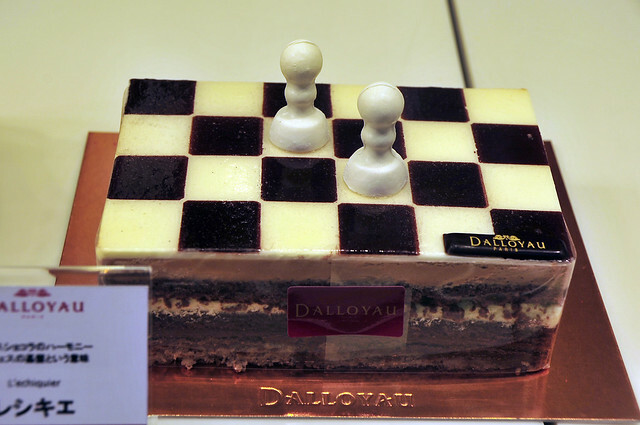 An finally Echiquier, another entremet created in 1993 with the folloing components – Biscuit aux amandes, génoise au chocolat parfumée à la gousse de vanille Bourbon de Madagascar, déclinaison de trois chocolats : chocolat noir 64% cacao – origine Equateur en chantilly, chocolat blanc et chocolat lait 40% cacao en mousse. So next time you are in Shinsaibashi-suji. 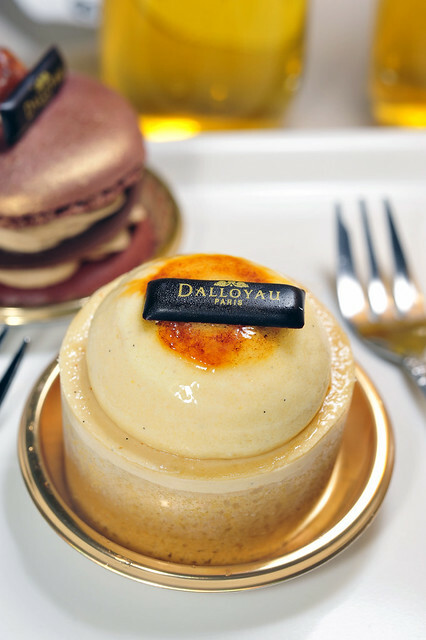 Do stop by Dalloyau to sample and stare at their cakes and macarons! Hope it would be as enjoyable for you as it was for us! This entry was posted on March 22, 2012 by Alan (travellingfoodies). 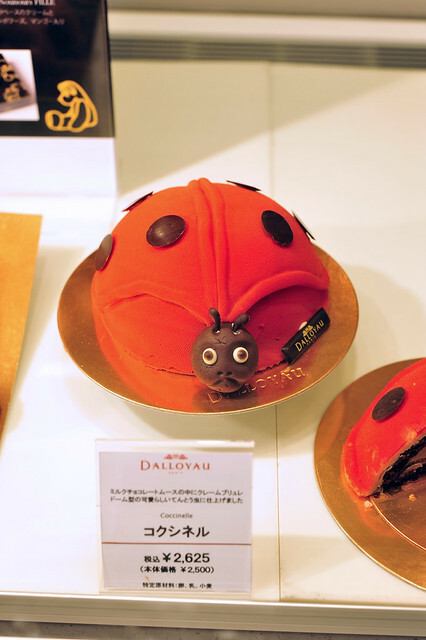 It was filed under Food, Travel and was tagged with abricot, cakes, Dalloyau, entremet, fresh pastry, fruit de la passion, Japan, kansai, macaron, mangue, noisette, osaka, petit gateau, praline, Salon de Thé, shinsaibashi, yuzu. You are really a bakery expert! After read till end of this post, I confused with all the names, hehehe..nevertheless they have all nice creation. Ya, you saw a shop specialize in Castella, do you know the name of the shop? There are a few shops which specialise in castellas actually. walk around shinsaibashi and the peripheral streets and you will see! lotsa treasure hunting! Oh so delicious looking, how did you ever choose?! Thanks for the information. Have a lovely weekend! alan, one thing very good of seeing and sampling all these gives you a lot of ideas and inspirations. 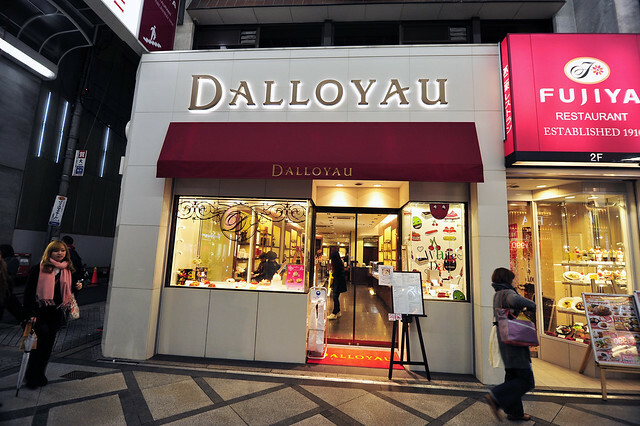 And you know something, of all the bakeries that you visited, i think i will never forget the name of this shop..’dalloyou’ i’m not sure if you understand cantonese..dalloyou ..’dai lo yau’ is big bums..oops..sorry! Yah i understand cantonese! I was laughing out aloud when I walked passed that shop also. The Japanese folks must be thinking I’m crazy!